2012 started with lots of snow and coldness in the Alps, end of January and the beginning of February it really turned very cold and in many areas lots of snow came down again. Real winter indeed. Our picture for the calendar sheet March is from the archives of last year – as the best thing about March cannot be seen below an evening sky, we chose a photo from the afternoon: green meadows and blue sky, finally the colours came back and we don't have to glance at colourful beanies, striped tea mugs and brightly coloured ski suits for some colour therapy. Don't get me wrong: I love winter, we all love snow and real winter hast to be cold and harsh at times. But as much as we like winter, we love spring and the change of seasons. Nature changes all the time, although we sometimes don't see it, as most thing that happen, happen under a high wall of snow. But when the snow slowly melts, than we can see the first early bloomers greeting us. Usually in February, but sometimes in March we are already there and the snow has melted and the lawn still in brown-green starta to soak in the late winter sun, than the growing and germination takes place. The biggest change you see is on the ground, where brownish colours vanish and the green takes over, in between some colour from the first flowers – and, we never get tired to remind everyone the first wild herbs are growing, like wild garlic or ramson, which give us many vital necessities from vitamins to micronutrients for a powerful start into spring. By the way, this year we started early to add another of our very popular wild garlic dishes to our recipe collection: wild garlic pesto, a delicious spring recipe. 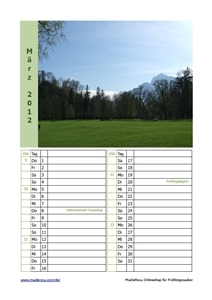 The picture of our March calendar sheet was made in Hellbrunn, Salzburg, Austria, a beautiful park area, on the outskirts of the city of Salzburg. Hellbrunn is not only a huge recreational zone, it has a castle, a so-called pleasure palace, there are exceptional trick fountains and a grate playground for children and a huge lawn for picnics and to play. We see a late sunny afternoon end of march where nature starts to prepare for the greatest green theatre, when the leaves return: light bright yellow-green, lush grass green and intense fir green, soon everything will be covered in multitudes of green. Green, green, green everywhere, a sight I can't get enough of. We see a prelude of the big greening in the photo, on the upper left you can see the branches of a weeping willow, tiny little green-yellow leaves start to grow, the chestnuts in the alley show first green spikes of there exceptional leaves soon to grow big . The Hellbrunn mountain shows the first idea of a soon to be huge green umbrella of leaves which will hide the forest grounds. On the small hill you can still see the "Monatssschlössel" (monthly castle), which will soon be hidden by leaves, the big mountain to the right, that is the mystical Untersberg. Download your Calendar Sheet March and print it out. Although March 2012 is in the time of lent and Easter seems to be far anyway, on April 1st the Easter Week will start with Palm Sunday . Therefore, March is the perfect time for the preparation of the big Spring Feast and to start with some Easter Crafts like a Cress Egg.